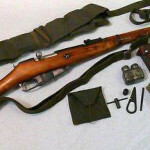 This rifle was the mainstay of the Red Army in World War II. It’s a sturdy, rugged bolt-action rifle firing the powerful 7.62R rifle cartridge. These rifles are extremely inexpensive and are a perfect starting rifle in reenacting. If buying online, they usually come with the sling and most cleaning accessories. Also available in the sniper variant; however, check with the CO before buying a sniper pattern rifle. Please obtain one of these before buying any other weapons, even if it is just as a back-up weapon; where as other more complicated weapons may fail, the trusty Mosin Nagant never will. Magazine: Internal box, 5 rnd. It was soon realized that the M91/30 was too long and heavy to be useful for troops who would not always be in direct combat or where overall weight needed to be kept at a minimum; such examples of troops who needed a lighter weapon were the airborne paratroops, artillery and machine gun crews, and the cavalry. To solve this problem, the M38 carbine was developed. 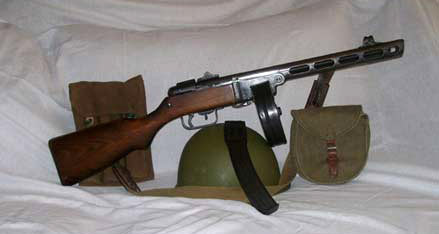 Essentially a shorter version of the M91/30 rifle, the M38 carbine had the same 5- round magazine, bolt action, and similar stock components. This rifle wasn’t originally intended for the average infantrymen to use, but still made it into the hands of those riflemen that were lucky enough to receive this lighter rifle. It was never issued with a bayonet, nor ever intended to have one. This rifle is permitted for use with the 3rd Rifle Division in limited numbers- check with the Commanding Officer before buying. Long before the outbreak of WWII, it was realized that bolt-action rifles were quickly becoming outdated. The result of much research and development was the SVT-38, later refined and redesignated the SVT-40 rifle. It was a semi-automatic rifle using an ingenious gas-operated blowback system, firing from a ten-round removable magazine. While initially only seen in the hands of snipers and NCOs, this weapon quickly filtered down through the ranks. Intended to replace the Mosin Nagant M91/30, it never reached the needed production, though it was still quite common in the Red Army. A temperamental rifle, the SVT-40 is nonetheless both a good reenacting weapon and a great investment. Blank adapting will be necessary to get the most out of the SVT-40. Perhaps the most famous of all the weapons ever used by the Red Army, it also happens to be one of the best. 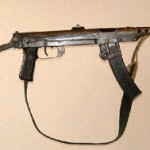 Firing full or semi automatic, using 35 round magazines or 71 round drums, and made entirely out of stamped and folded steel parts with a wooden stock, this weapon was crude, effective, and durable, while being incredibly easy and cheap to manufacture. It is also said to have a slight edge in accuracy over all other submachine guns of the time period. This is a great weapon to have for Red Army reenacting, though obtaining one can be difficult. If possible, try to run down one of the semi-auto variants out there- several models have been made or are in production. You will need to blank adapt it first before using blanks in it. 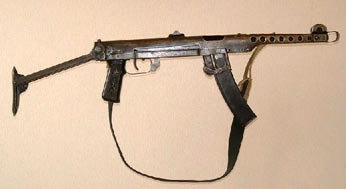 The PPS-43 is a direct descendant of the PPSh-41, having been created in response to a requirement for a simplified version of the more labor-intensive PPSh-41. The prototype of the PPS-43 was first put into production inside Leningrad during it’s 2 and a half-year siege, and was made using the most basic of machinery, minimal labor and materials from within the trapped city. Mechanically similar to the PPSh-41, the only major changes were replacing the solid wood stock with a folding metal stock, adding a pistol grip, and creating a new barrel shroud. 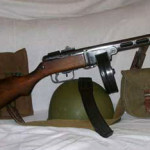 The weapon uses only specially-designed 35-round magazines, as the drum magazines were seen as being too unreliable and expensive at the time. Semi-automatic replicas of these are just starting to hit the market. Like the PPSh-41, it will need to be blank adapted. 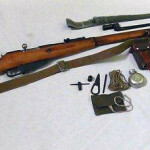 Combat experience quickly showed two things in the Red Army: (1)the current standard issue rifle, the M91/30, was too long for use in the crowded house-to-house fighting of urban battles, and (2) a bayonet was needed for all bolt-action rifles, even if the rifle was meant to be used as a last resort. This last requirement was in response to the M38 Carbine not having any provision for a bayonet. 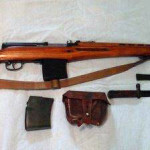 The Russian weapons bureau quickly solved the problem by combining the already-produced bolt-action M38 Carbine with a permanently attached side-folding bayonet. This allowed the bayonet to be swung into action in seconds, and was always ready for action, while being attached to a lightweight carbine for ease of mobility. After a year of front-line testing, the new rifle was designated the M44 Carbine, and full production was ordered. This carbine uses a 5-round internal box magazine like all other bolt-action Russian rifles of the time period. It is a lighter, less bulky alternative to the M91/30. A neat weapon to have, it is only usable in later-war battles, when they would have been just reaching the front-line troops.